If you’re in the market for a powerful new pickup truck that can give you the horsepower and torque you need every day while also offering you the interior luxury you desire, the 2019 Nissan TITAN XD® is an excellent choice. This year, the 2019 Nissan TITAN XD® in Brownsville, TX offers two available engine options, innovative interior technology, luxurious comfort options, and a long list of safety features. 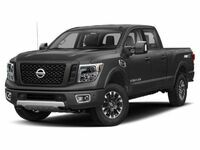 The 2019 Nissan TITAN XD® pickup truck is a heavy-duty pickup truck that delivers the incredible power and capability you need to tow large trailers and haul heavy payloads. This year, the new Nissan TITAN XD® is available in three body styles that include a Single Cab, Crew Cab, and King Cab. The five trim levels in the 2019 Nissan TITAN XD® lineup include the S, SV, SL, Pro-4X® and Platinum Reserve. With two engine options available in the new 2019 Nissan TITAN XD®, you’ll have no problem finding a powertrain that can give you the horsepower and torque you need to tow and haul. The standard engine given to the 2019 Nissan TITAN XD® in Brownsville, TX is the 5.6-liter Endurance® V8. This powerful yet fuel-efficient engine delivers an impressive 390 horsepower and 394 lb-ft of torque. When properly equipped, it can offer a maximum towing rating of up to 11,680 pounds and a maximum payload rating of 2,990 pounds. The second engine option available in the 2019 Nissan TITAN XD® pickup truck is the Cummins® 5.0-liter Turbo-Diesel V8. With a maximum payload of 2,490 pounds and a towing rating of up to 12,710 pounds when properly equipped, this engine can easily deliver the power and capability you’re looking for in a heavy-duty pickup truck. Interested in a Nissan Titan XD?